10-15-1972-California - My date and times are approximate. I was assigned as a Police Helicopter Observer with the Pasadena Police Department and flying night patrol. The pilot was Pat Spafford. In the northeast area of Pasadena, very close to the foothills, we observed what appeared to be a Military Sikorsky helicopter hovering very low over a residential area. The helicopter was turning its landing light off and on. As we got closer, it gained elevation and started heading westbound. Being curious we started to follow it. We were approximately at 1,000 ft. AGL. The military helicopter then appeared to lose altitude quickly as if it was going into auto rotation. Then about 300 meters past it, we saw what first appeared to be a large object looking like bunch of big balloons tied together. The object was going at our exact airspeed, which was about 60 mph. The object was round and appeared to be rotating. I saw no lights on it. Pat began yelling over the intercom that he was seeing a UFO. I immediately shut off our running lights so I could activate our "night star" search light. The running lights were shut off because there would be too many amps going through the system with all the lights on and pop a breaker. Shutting off the running lights to power up the searchlight was S.O.P. (Standard Operating Procedure). Pat questioned what I was doing, and when I told him I was going to "light it up", he said, "No," and turned the running lights back on. We had a short argument about doing this or not, but he got the final word because he was the pilot. We watched the object for a few minutes and it flew abeam us going west. We then noticed that there was some fog coming in the L. A. basin, which was a signal for us to fly back to Bracket Field in Pomona, where we hangared the helicopter so as not to get caught in the fog. As we approached the west end of the city near the Rose Bowl, this object gained speed and in just a few seconds accelerated towards the L. A. skyline and disappeared out of sight. The speed it went was faster than supersonic. We were both amazed at how fast it accelerated. We came back to the hangar and immediately started making calls. Pat called LAX to see if they had any such object on their radar. He got a "negative" from them. I called JPL in Pasadena to see if they had any kind of experiment going on and they said no. I was taken back by the response I got from them because the person I spoke to sounded like this was an everyday occurrence. We both wrote an incident report and turned it in. I kept this to myself until one day, about 2 weeks later, the Police Chief saw me in the hallway and yelled, "Hey Al, did you see any more giant Frisbees?" Since that time I have told this story to people but never made a big deal about it. I also never found out if anyone forwarded that report or investigated it further. I left the PD in 1979 to join the San Luis Obispo County Sheriff's Dept. Just thought I would tell this story to someone who would enjoy hearing it. Pat Spaffor passed away some time ago, but I'm sure there are plenty of people that will remember that story from the old days. I have attached a picture of myself with Pat Spafford taken around the time this happened. 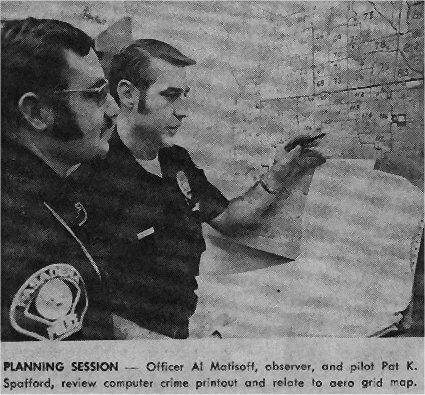 This photo was out of the Pasadena Star News on February 13, 1972.